I listened to the lords call and upon graduation moved up to Oregon, i applied for a couple youth positions, but none felt right. (I even applied for the job I have now, they told me I wasn’t quite what they were looking for). What does a bible college graduate looking for vocational ministry to do when no one is hiring full time? 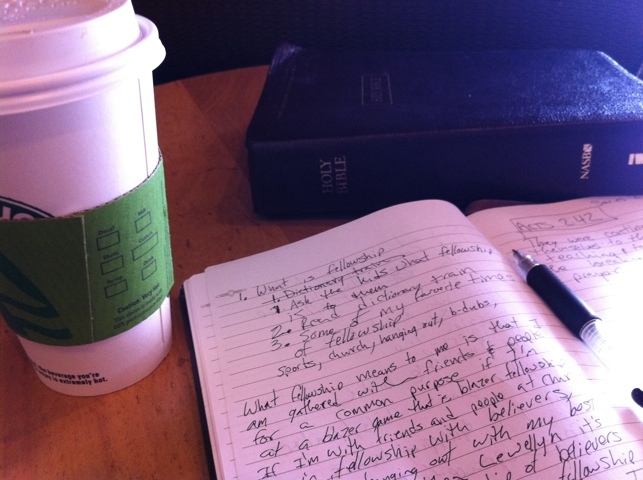 I got a job working at Starbucks, while I pursued ministry opportunities. I had to understand that my calling, my skills and my passion for ministry don’t pay my bills. The December before I graduated I met with Ron Swor where he told me “find out where God has called you, make yourself irreplaceable, God will bless that.” So what I did was I began serving at a church while working at Starbucks, understanding that my calling is bigger than a vocation. I followed Ron’s advice serving while working at a sbux from June-November. At that point after serving from may-October the church had taken notice of what I was bringing to jr. High ministry. They offered me an interview and then they offered me a full time Job. This is where I work today. The plan that I created for myself is nowhere near as good as the one that God had for me. Here are some tips I would have someone who is about to graduate. 1. Your calling is not to a vocation, it is to serving God. (Having a full time ministry position does not legitimize your calling more than a part time or a volunteer. All ministry is a privilege and should be treated the same. 2. Use your network! If you’ve gone to Life you have a network and are 1 or 2 people away from knowing someone who has a need in their church for what you are passionate. 4. Don’t church hop! Be consistent, even if you want to find a job in the area and want to put feelers out for jobs, fight the urge to do it during services. Pastors are too busy on Sundays and service days to spend enough time with you to have a meaningful conversation. (schedule a meeting during the week, always fit to their schedule) you can visit other churches, just don’t do it at the cost of your consistency. Serving at a local church consistently speaks louder than your degree does on it’s own. 5. Ministry is an incredible opportunity where we get to serve Gods people, not just a job. It’s who we are don’t forget that as you seek out the lords next steps for your life. Doing what I was born to do. There have been times in my life that I have wondered, “what on earth am I here for”. People encourage me with Jeremiah 29:11 and say God knows, others encourage me with other verses and little sayings. But what confirms to me what my calling in life is… Is when I have an opportunity to help someone increase there knowledge of who Christ is, who he can be for a person, what he has done for a person. I get so amped and excited at the opportunity to speak at a church, especially at the chance to let young people know what God has for them. All that to say I am really pumped for the word that the Lord has given me for the WSFC Fusion jr high group. It’s changing me right now while I study for it. Can’t wait to be with them. I am currently watching the play by play gamecast of the University of Oregon Ducks against the New Mexico Lobos. Now it is only half-time so I don’t want to brag or get cocky but 59-0 is a substantial lead. But what I am talking about here isn’t about the score, it is about the interworkings of the team. The Ducks “fired” QB Jeremiah Masoli, because of his bad behavior off the field, he may of been the “best” QB for the Ducks; But what he wasn’t, was an upright individual. Also suspended for one game is Lamarcus James the star RB for the Ducks, for his off the field harassment of his girlfriend.To add to that, last year in the season opener RB Le Garret Blount punched a Boise State Bronco. Oregon suspended him for the regular season after one game. Now this is only the first game, but still the Ducks are managing to show something. That seeking excellence in all aspects is greater than just seeking it in one area or another. 1Here is a trustworthy saying: If anyone sets his heart on being an overseer,[a]he desires a noble task. 2Now the overseer must be above reproach, the husband of but one wife, temperate, self-controlled, respectable, hospitable, able to teach, 3not given to drunkenness, not violent but gentle, not quarrelsome, not a lover of money. 4He must manage his own family well and see that his children obey him with proper respect. 5(If anyone does not know how to manage his own family, how can he take care of God’s church?) 6He must not be a recent convert, or he may become conceited and fall under the same judgment as the devil. 7He must also have a good reputation with outsiders, so that he will not fall into disgrace and into the devil’s trap.8Deacons, likewise, are to be men worthy of respect, sincere, not indulging in much wine, and not pursuing dishonest gain. 9They must keep hold of the deep truths of the faith with a clear conscience. 10They must first be tested; and then if there is nothing against them, let them serve as deacons.11In the same way, their wives[b] are to be women worthy of respect, not malicious talkers but temperate and trustworthy in everything.12A deacon must be the husband of but one wife and must manage his children and his household well. 13Those who have served well gain an excellent standing and great assurance in their faith in Christ Jesus. Excellence in all aspects will make us a better part of the body, because all that flows out of our lives is excellence. My hope for this blig is that it doesn’t become a place for me to lament, I was even hesitant posting this because the last thing I want to be is a debbie downer. But this is the season I am going through. These past two weeks have been a whirlwind of feelings for me. So many things flying my way, faster than I could handle and heavier than I’m used to. With the death if my grandpa, I faced a loss greater than I have ever experienced, the man who was pivitol in making me the man I am today, suddenly gone and never to put me to work or teach me an important life lesson. That same week, I was able to see my closest friends graduate. That was a joy but also a deep loss. I have never been at this place in my life, it is a road completely untraveled. What I have learned is that God surrounds you with good people who will help walk down the path. I have really started to understand what Paul meant in Philippians 4:6-7 that bringing everything to the Lord in prayer and he will grant you peace far beyond my own understanding. This time may be difficult and it may take me a while to process it all, but the Lord is with me. I know that he will guide my path and I will get through this because he is constantly making me stronger. This past Sunday, I received word that my Grandpa had passed away. This was news that I had never thought I would receive simply because I thought Grandpa was too stubborn to die. The call came and I was shocked, I felt as if I had been hit in the stomach with a baseball bat, the life had been knocked out of me, I couldn’t respond, all that I could muster up the strength to do was stand there and remain silent. I had no idea how I was supposed to respond. This is the first time I have experienced a death as close as this, I don’t know how to handle this. Learning how to handle a death in the family isn’t something that we come equipped with, it isn’t something they teach you in high school or college. Death is ironically, only something we deal with as we experience more life. I haven’t lived enough to know how to deal with death. I am 1,000 miles away from my closest family member, needless to say these past two days have been extremely difficult. I may have not experienced something like this, but I have been blessed by the people around me who have and have given me wisdom to get through this difficult time. The three things that have helped me the most, through this time have been. Honor my Grandpa, remembering who my Grandpa was, he had lived a life that made it very easy to honor him. Hardworking, I have never met a man in my life who was more hard working than my Grandpa was. He always worked extremely hard at whatever he did, and he always became successful at it. He worked a variety of jobs to provide for his family, and his work ethic carried out even through his retirement. He is the only person I have ever met that worked hard everyday throughout retirement. For the last twenty years I always remember how Grandpa was tending his “small garden” which was more like a small farm (really it was twice the size of most people’s backyards) . He worked diligently and tirelessly in that garden, because that is what he loved to do, work hard. Dedication, Grandpa was dedicated to doing his best for not only himself, but even putting the family first even if it meant more work for himself. Loving, Grandpa was an extremely loving person. He loved every single one of his children so much, each child of his felt his love as an individual and as a family. He loved every single one of his grandchildren so much, that there was never a time where Grandpa didn’t greet you with a warm hug and an even warmer look followed by a simple “why hello there” which we knew meant I love you and I am proud of you. Grandpa loved Grandma more than I knew you could ever love someone. They were married over 60 years and there wasn’t anything that my Grandpa wouldn’t do to ensure the well being of my Grandma. Loyal, if you look up loyalty in the dictionary, George Wrede’s picture should be next to it. My Grandpa was the most loyal friend anyone could ever have. Whenever any of his friends were going through something, Grandpa was there, whether it was picking them up to take them to dialysis or helping them with yardwork or simply just being a friend, Grandpa was there for his friends. He never complained about it, rather he did all of these things with joy becayse he knew, that is just simply how you act as a friend, father, husband, and as a Grandpa. Who was Grandpa to me as an individual? My Grandpa loved me unconditionally, never afraid to tell me that he loved me no matter what project I had messed up on or if I had accidentally balded his lawn with the mower. I always felt nothing but love. Grandpa was never afraid to put me to work, sometimes it was to the point where it was somewhat annoying, but it instilled a work ethic in me that I know will carry on through the rest of my life. My Grandpa was such a huge support in my college career. I cannot begin to express how awesome I felt hearing the words “I’m proud of how well you are doing in college and in work”. Grandpa was so quick to encourage me in what I was doing academically and career wise. Grandpa was such an influential part of making me who I am today. How do I honor my Grandpa? I take the example that he has laid before me and follow in his footsteps. Living my life not for myself , rather living to help out others through being the best version of myself that I can be. The next thing that I have learned through this process is that it is important to be with your family. When you are 1,000 miles away from your nearest family member, it is extremely hard to face the death of the family patriarch. My family is so important to me, and the importance of family is something that I learned from my Grandpa. He always made it very clear that family sticks together no matter what is going on. Family is a unit that functions together in order to provide support for eachother. Being away from parents, siblings, aunts & uncles, and cousins has been hard on me. (Luckily I am currently flying home, and I get to be there for my family, with my family). The family legacy that my Grandpa left behind is strong and we are a stronger unit because of him. The last thing that I learned today from one of my friends was the advice “don’t forget to take the time to mourn, because if you don’t it’s not good and you will carry it with you”. These were some very important words for me to hear. They have been running through my head all day and I have spent all day thinking about the importance of mourning. These words which were spoken to me actually inspired me to write this post. (As I sit here on the plane tearing up after almost every word and memory I have of my Grandpa passes through my mind, it is truly helping through this difficult process.) Mourning allows for healing. Taking the time to process through my loss is helping me rejoice in the life that my Grandpa lived, remembering the legacy that he is leaving through his family. I am learning to let go, to celebrate the life and to be there to help my family go through the same process. Grandpa Wrede, thank you so much for who you were/who you will continue to be in the lives of your family and friends. You leave behind a great legacy, a family who will never be the same without you and who is better off from the man you were to each individual. You will be missed and always be loved.